Megan, it's a great site and the photography is really good too. I posted a link to my surgical team's yahoo group (I'm a patient). It is a great resource! I know how much work this can be, keep it up! Thanks Anonymous! I really appreciate that! Hi Meagan! This is a great site! I was recently banded on August 31,2009. I am still adjusting and trying new foods, so that I won't get tired and bored with eating the same things. 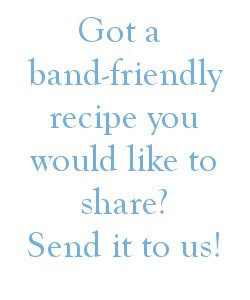 Do you know if there are some other websites also that give out band friendly recipes? It isn't 100% band friendly, but they have some great recipes. Again, It isn't 100% band friendly. But she did have a gastric bypass. She has a lot of recipes using protein powder. She has some great band friendly recipes on her site. How do many of you measure your food. I am seeking the easiest way. With a scale or measuring cup. And do you measure and then store for easy reddiness. In the beginning I did both. I would weigh my meat and measured anything thing else. I would also divided food up into containers. Now that I that I have more experience, I don't measure...I just eyeball it. Every once in a while I will measure my food, just to check that I am not over or under eating. I still divide up my left overs in glad ware containers that holds about a cup. I just got my band this week. I am starting to feel back to normal and looking forward to the changes I am making. Megan your pictures are lovely and this site has been so helpfull to me.I was hoping to find a site that would appeal to the cook in me, yours sure did! THANK YOU! This site is great. I've had my band just over a year and just found out about it! Oh well, better late than never! Thanks for all the great ideas! I think your site is great and hope you don't mind I liked to it from my blog. If you want me to remove it, just drop a note. Anyway we want to say Thank you for sharing. It's been very helpful so far. This website is fantastic! I never knew there were so many cool and simple recipes for bandsters out there! Im over filled at the moment and have been struggling along, but your website has inspired me to get a small unfill so I can start preparing healthy and yummy recipes. Im going to be showing this website to my dietician who is exclusively for bandsters for my surgeon. She will love it! Lynette- I am so glad you like the site. I hope it helps you get lots of ideas! Hi Meagan! My name is Doug and I'm going to be getting my lap band very soon. I was told that I need to eat 60 grams of protein a day. Do these recipes account for that daily protein. I wish you were on Twitter. I brag about your food all the time. Hello, I'm scheduling myself for the band and wondered how you were doing? I haven't seen any post since May, so I was wondering how it was going? Thanks! Megan, I'm so sorry for your loss. I'm scheduled for surgery January 18. I look forward to reading you're updates and I think I may start a blog of my own for the journey. Thanks for your posts and good luck with your school! I wish you would post more often. I enjoy your blog and recipes. I just found your site and think it is WONDERFUL!!!!!! A thousand thank you for you labor here. I think why so many fail is they just don't k ow what to eat and go back to bad habits. I've gone through most of your recipes and I can eat each one everyday. Could you please tell me if you put any liquid in your black beans with the 1 lb. of beans in the crock pot, the ones you freeze in ice cube trays? Love this site have gotten lots of great ideas from you. thank you!!! I just had my band 5 weeks ago and l am struggling to find receipes .